I was down on the Texas-Mexico border this weekend. I met with Federal officials, and I met with State officials as well. I want to commend the work that the State of Texas is doing to protect and secure the sovereignty of the United States, including the Department of Public Safety, local law enforcement, Parks and Wildlife law enforcement, the Texas Rangers, and soon to be the National Guard. It is obvious to me that they are on the border and they are protecting the sovereignty of our country for all Americans. While meeting with the Border Patrol, I asked them where are these people coming from that are so quickly coming to the United States. They told me they are coming from 144 countries. Most recently, 2 weeks ago, there were three Ukrainians who crossed into the United States. The reason why is because the word is out to the world that if you can cross into the United States through Texas, you are going to get to stay. That is too bad. That is tragic. It is the first duty of government to secure the national borders of any country. That is the obligation of our country, and it is the obligation of this administration. We protect the borders of other nations. 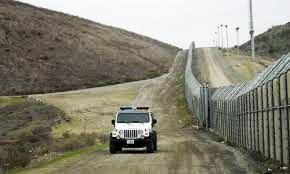 It is about time we protect the border of the United States of America.